What Day Of The Week Is December 22? 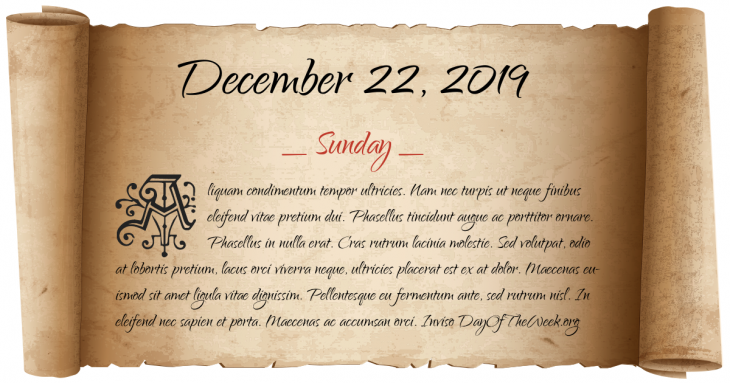 December 22, 2019 is the 356th day of the year 2019 in the Gregorian calendar. There are 9 days remaining until the end of the year. The day of the week is Sunday. Emperor Vitellius is captured and murdered at the Gemonian stairs in Rome. Colo, the first gorilla to be bred in captivity, is born at the Columbus Zoo in Ohio. The Parliament of Croatia adopts the current Constitution of Croatia. The repeal of the Don't Ask Don't Tell policy, the 17-year-old policy banning on homosexuals serving openly in the United States military, is signed into law by President Barack Obama. Who were born on December 22?